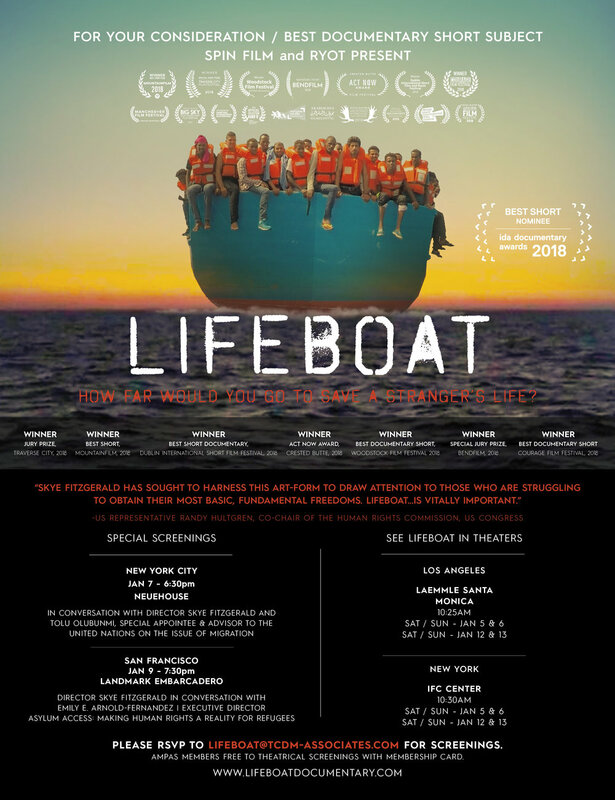 LIFEBOAT is a 34-minute documentary film that captures the desperate plight of refugees as they undertake the dangerous Mediterranean crossing from Libya to Europe in rubber boats. In a real-life context with dire consequences, LIFEBOAT puts a human face on one of the world’s greatest contemporary, global crises and provides a spark of hope surrounding how civil society can intervene in the refugee crisis in a meaningful way. In the latest episode of “A Way Home Together” we talk about why restrictions on the #HumanRights of one group of people can impact all people. ‪Tolu also shares her personal story of advocacy, and her many struggles and triumphs as one of the world’s 258 million international migrants. Our podcast is produced with help from our friends at IOM— the U.N. Migration Agency. The International Metropolis Conference is the largest annual international conference that explores emerging issues around migration, mobility, and integration. Metropolis 2018, which will be held at the International Convention Centre Sydney will explore Global Migration in Turbulent Times. On September 24, 2018, during the 73rd UN General Assembly, Tolu will join the United Nations Secretary-General, the President of the UN General Assembly, Heads of State, CEOs of global companies, foundations, and NGOs, and youth leaders for the launch of Youth2030: The UN Youth Strategy and UNICEF’s Generation Unlimited partnership. Youth2030 provides the unifying framework for a UN-System wide reset and reorientation of youth-focused campaigns and activities. It stresses the need to engage young people so they can more meaningfully contribute to the work of the United Nations, and to ensure the UN can benefit from their views, insights and ideas. As the first new action of Youth2030, Generation Unlimited will tackle the global education and training crisis currently holding back millions of young people and threatening progress and stability. WATCH THE LAUNCH with UN Secretary General Secretary-General, António Guterres, President of Rwanda, Paul Kagame, Prime Minister of Denmark Lars Løkke Rasmussen, World Bank Group President Jim Yong Kim, Microsoft President, Brad Smith, BTS, Lilly Singh, Graça Machel, and others. The UN Migration Agency’s Director General has selected Tolu to serve as an advisor to the United Nations Department of Global Communications in New York. She will focus on youth engagement on the Sustainable Development Goals (SDGs) and migration. Passionate and Vocal Supporters of the Anti-Slavery Movement Turned their Outrage into Action and Marched in the Streets of L.A. In November 2017, CNN reported that African migrants were sold off as slaves in Libya for the equivalent of approximately $400. To raise awareness about migrants being abused and exploited in Libya and other countries around the world, USA for IOM, the non-profit partner of the International Organization for Migration (IOM), joined the “March Against Slavery in Libya and Beyond” in Los Angeles, California. Watch Tolu's powerful speech and join the movement to end modern slavery worldwide. 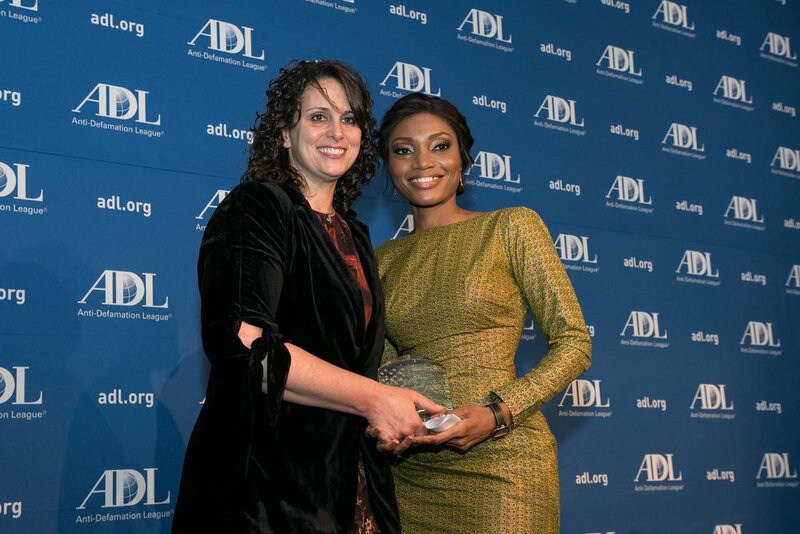 The ADL In Concert Against Hate honors unsung heroes who have stood up against intolerance, extremism, and injustice. 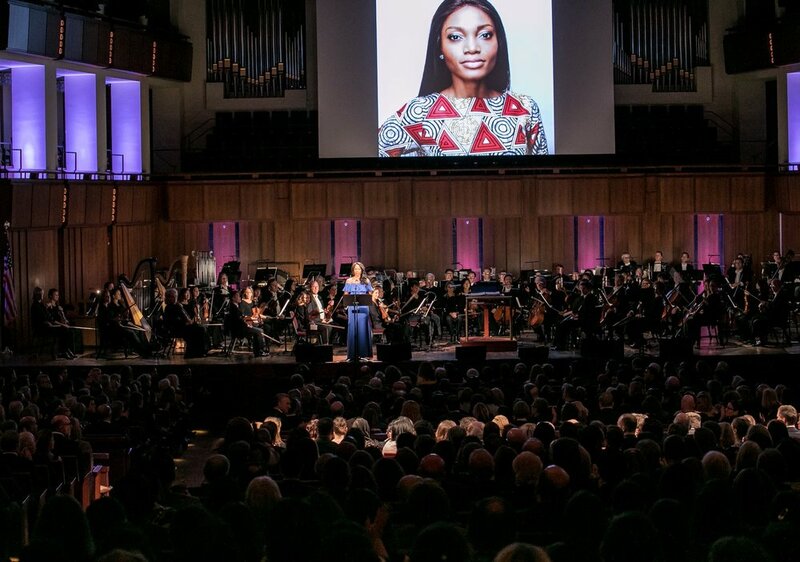 The Concert is performed by the National Symphony Orchestra and attended by more than 2,000 people from Washington, DC and across the nation, including elected leaders and government officials, university presidents and school superintendents, teachers and students, civil rights, religious, civic and community leaders, law enforcement and prosecutors. Previous honorees include Congressman John Lewis, Ruby Bridges, Daniel Pearl, and Judy and Dennis Shepard. Tolu Olubunmi co-chairs Investing In Women: Smart, Profitable, Accessible with Glenmede and BRAVA Investments. Glenmede and BRAVA Investments are bringing together industry leaders to share their perspectives on how investors can grow their assets while also advocating for women. The discussion will focus on impact investing and how it can be leveraged to elevate the position of women globally. Event co-chairs include, Assemblyman Michael Blake, Erika Dilday, Kerry Kennedy, Kathryn Kolbert, Samantha Miller, Marie C. Wilson, and Sheryl WuDunn. BRAVA Investments, LLC names Tolu Olubunmi to its Board of Advisors. More than an investment platform, BRAVA is a new take on impact investing that emphasizes outcomes over optics, for both investors and for women. We exist to deliver returns to investors and real, measurable results for women. Tolu Olubunmi joins the Board of Directors of USAIM for IOM, the United States based non-profit partner of IOM, the UN Migration Agency. The hard work of turning our call to action into action begins. I'm honored to join Lawyers for Good Government (L4GG) and RISE When We Fall for the Rise Above Conference - inaugurating the new movement for equality, justice, freedom, and a government that works. "For millions of Americans, election night 2016 was a call to action. The result? An extraordinary groundswell of political energy. On social media, on university campuses, in company break rooms and at community events, people gathered, shared ideas, and worked together to figure out how best to protect our most important rights and freedoms. Lawyers for Good Government Inc. and RISE When We Fall, two organizations at the forefront of this emerging movement, are now joining forces to host "Rise Above," a conference designed to coordinate and convert this unprecedented political energy into meaningful results." January 21 - 22, 2017 at the Lincoln Theatre & the Mayflower Hotel in Washington, D.C. I am honored join the International Organization for Migration (IOM) for its first Global Migration Film Festival. The Festival will celebrate the many positive contributions of migrants to the hosting communities and reflect on the benefits of diverse and multicultural societies. Tolu is honored and humbled to be named alongside philanthropy powerhouse Oprah, Indra Nooyi, Pricilla Chan, Susan Buffett, Beyonce, and many other incredible women. On Tuesday June 14th, Tolu will join President Barack Obama, First Lady Michelle Obama, Oprah Winfrey, and key players advancing the state of women and girls all over the world at the first-ever United State of Women Summit. Tolu will be contributing to the conversations on Civic Engagement and Empowering Women and Girls in STEM. Designer Carrie Hammer’s bi-annual New York Fashion Week runway show featuring CEOs, Executives, Olympians, Activists, and other inspiring women on the the runway in lieu of traditional models to help women realize that real beauty lies in our differences, our power, and our accomplishments. In recognition of International Women's Day on Sunday, March 8th, the World Economic Forum honors 15 women who are making a difference all over the globe.